"We know the future will outlast all of us, but I believe that all of us will live on in the future we make." -- Edward M. Kennedy, quoted in this morning's New York Times obituary for the Massachusetts senator. The line comes from a speech Kennedy delivered when he received an honorary degree at Harvard last December. In nearly two decades of Washington journalism, I have never come anywhere near as close to stumping a lawmaker as I did when I was a 12-year-old volunteer on Ted Kennedy's 1980 presidential bid. My volunteer work on Kennedy's campaign for the Democratic nomination had nothing to do with politics. My sixth-grade political views were embryonic, at best. But the campaign staff conveniently located their D.C. headquarters in an abandoned Cadillac dealership on 22nd Street NW, just a couple of blocks from my mother's office. Having nothing better to do with her pesky son when school was out, she took me to work with her and then dispatched me to the Kennedy HQ down the street. And the campaign staff kept me plenty busy: I worked in the mail room; I photocopied donor checks and FEC documents; I fed audio clips to local radio stations over the phone; I couriered packages across town; I helped set up chairs for a fund-raiser on the lawn at the senator's McLean home. It was like a wonky summer camp. As the Democratic primaries wound down in early June, Kennedy came by the office to thank the troops. This was my opportunity to get the candidate to sign one of the black-and-white photos that I had signed in his name for many supporters when I worked in the mail room. "May the Force be with you, Senator." What else would a 12-year-old say in 1980? "The Empire Strikes Back" had just come out in theaters. Kennedy was baffled. "Uh, thank you -- very much," he said in that distinctive "Kennedy accent." Then he signed his picture and moved on. His brother John may have charted humanity's path to the Moon, but Senator Kennedy clearly was wondering how his campaign had been infiltrated by a little alien from a galaxy very far away. Admiral Thad W. Allen is a Webby guy. The commandant of the U.S. Coast Guard is on Facebook. He blogs, he tweets, he podcasts. And he carries around a coffee mug. 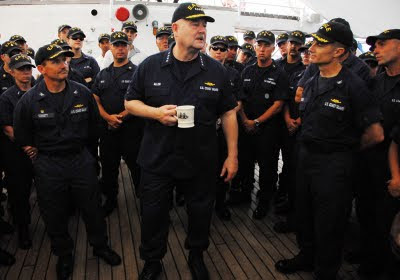 The admiral explained how and why online communications is changing the seafaring business in a recent interview with gCaptain, a Web site for maritime professionals. While much of the discussion was technical, given the audience, Allen also made broader points about why shipping may have been a late-adopter compared to other, less tradition-bound transportation sectors. "...What I try to do is compare and contrast the aviation community with the sea-going community. The aviation industry is a product of the 20th century. Because there was such a premium placed on safety, with many passenger and cargo flight incidents early on, our air traffic control system is now one of the safest and most transparent operations that you will see anywhere. Pilots are used to being given commands to go from point A to point B and cleared for a specific altitude, then cleared for final and cleared to land. That type of control in the maritime environment is something no one has ever seen and will probably take some getting use to. "For a thousand years we have operated on the water where anonymity was a proprietary advantage, you didn't want anyone to know where you were going based on what goods you were carrying or what the markets were doing. The fact is that modern economics is driving us in a direction, not solely because of safety and security, but as a profit motive for visibility of the supply chain. Business managers want to know, anywhere in the world, the location of a container and this information is not possible without knowing the location of the vessel carrying it. "So I think we are being pressed this way for economics but on the safety and security side the automation of our vessels and its sensors makes it possible to be anywhere on the ship and understand the entire operation. The days of wipers, oilers and engineering officers making rounds is rapidly disappearing. For example, I've made the comment that our new national security cutter, the Bertholf, is really a computer with a ship attached. "I am not sure it's a matter of everyone having to change. I think it's a new environment and operators have to realize this or be overtaken."